Start with one of five premades. 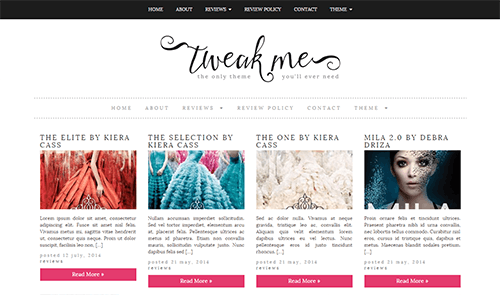 Tweak Me comes packed with five different ready-made designs. Optionally, you can pick one of these to serve as your starting point and kick-start your branding. Change colours, fonts and layouts. 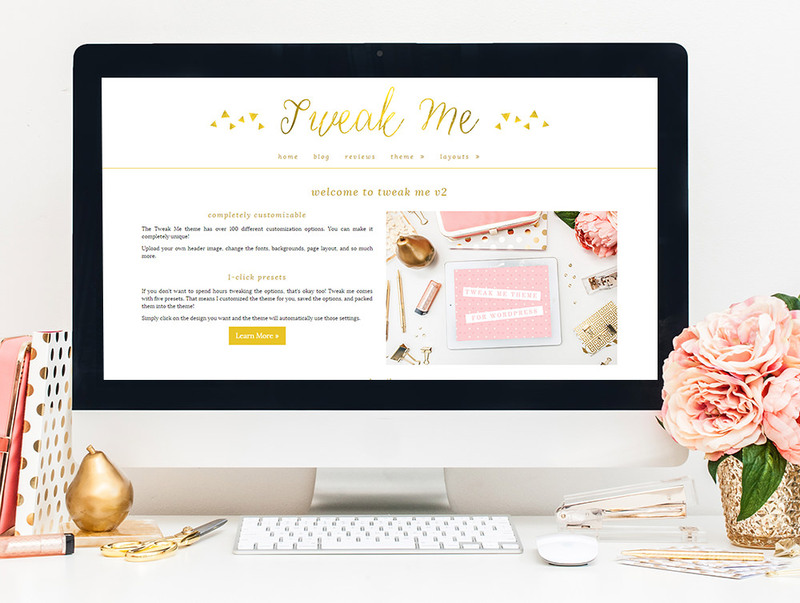 Everything about the theme can be customized. 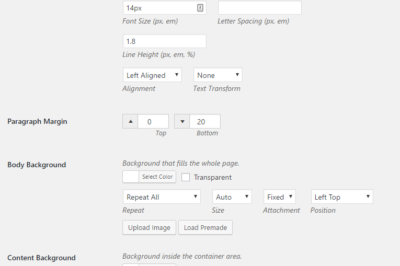 Change the typography settings for different parts of the site, including body, post titles, page titles, widget titles, and more. 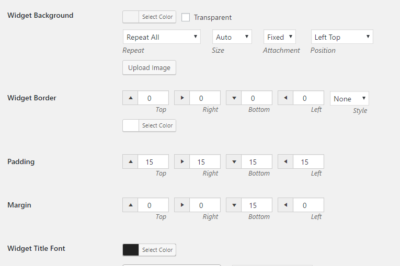 You can choose a default layout in the settings panel, but then override that layout on a per-page (and per-post!) basis. 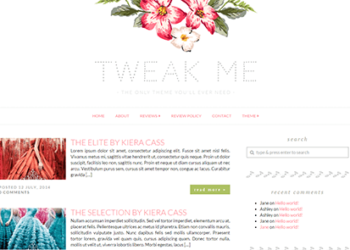 Tweak Me comes with multiple “information builders”. You can choose which information to show, which to hide, and what order they should appear in. Import and export tools are available so you can easily move settings between WordPress installations. 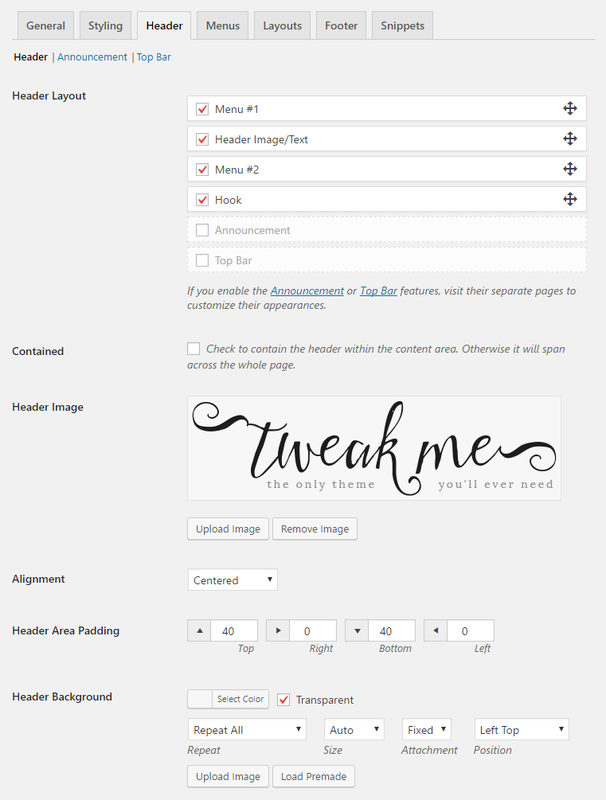 Theme updates are delivered automatically inside WordPress. Instructions are available online but extra help is provided if you need it! 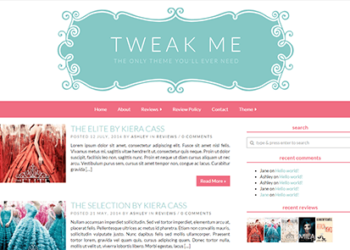 Check out the huge gallery of sites using Tweak Me. This is the last theme you’ll ever need—are you ready? Fix: Custom Font Awesome bullet point icons not showing up. Fix: Allow spaces when saving social media icons. New: Upgraded to Font Awesome 5.5.0. You may want to double check your icons to ensure they're still formatted correctly. Tweak: Added support for using shortcodes in post meta configurations. Tweak: Now using blog date format for comment date/time. Fix: Make sure custom CSS file uses correct URL scheme. This fixes an issue that sometimes happens when you switch to HTTPS but don't redirect HTTP. Fix: Post titles not linking on search archives when "full posts" are enabled. Fix: Feedburner widget not using https on form. Fix: Change how widgets are initialized to be compatible with later versions of PHP. New: Added support for featured images on pages. Fix: Unable to remove second social media icon in the list. Tweak: Removed "Remove" button for first icon in social media list (first one cannot be removed). Fix: Remove Font Awesome icon from Sharedaddy icons. Fix: Theme settings not displaying correctly if custom CSS file is unable to be created. Fix: array_key_exists() error when all static homepage layout options are unchecked. Fix: Custom column widths were incorrect when overriding post layout via the post/page metabox. New: Option to move comment form above comments list (Appearance > Theme Settings > Layouts > Comments). Fix: If filled out, the affiliate ID is now appended to Nose Graze Shop link in footer. New: Added Nose Graze connection check to the system info file. 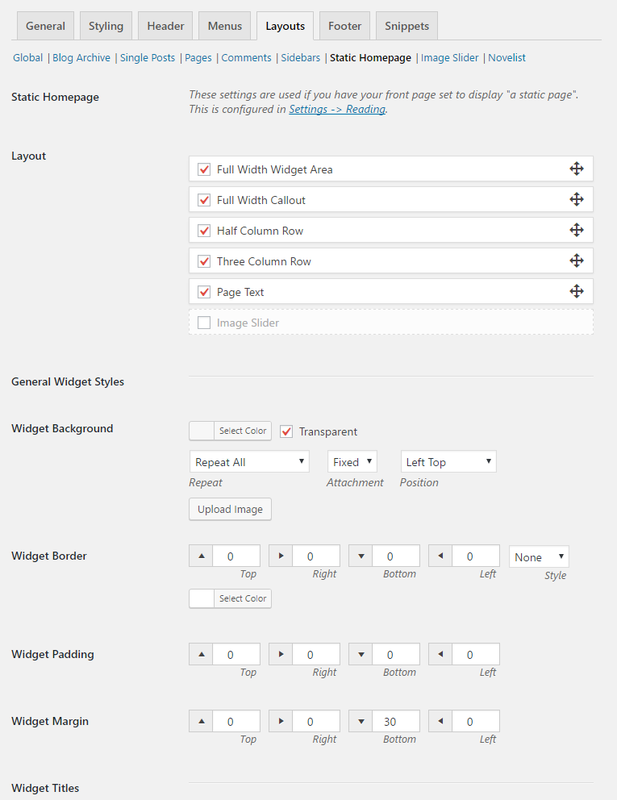 Fix: When using 1 column for the footer widgets, widget didn't span the whole page. Fix: Array key exists error on system info after fresh install. Tweak: Updated theme updater class. 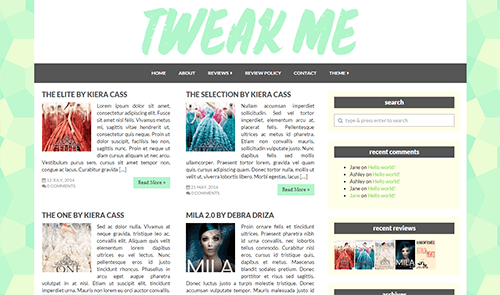 New: Sidebars can now be used on static homepage template. 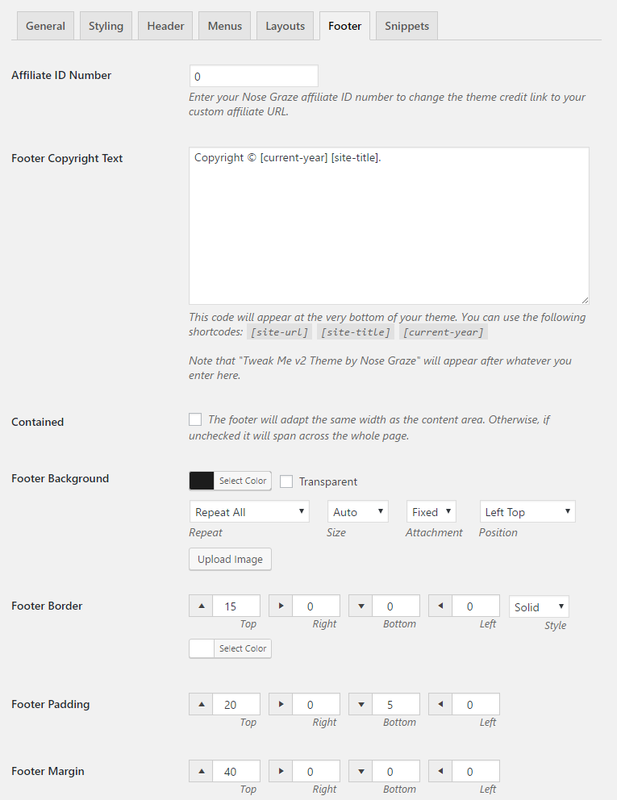 New: You can now customize the number of footer widget columns (Appearance > Theme Settings > Footer > "Number of Columns"). 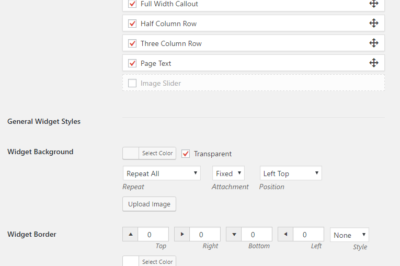 New: Setting to customize column proportions (Appearance > Theme Settings > Layouts > "Column Width"). Fix: Ocean theme not showing selected images in Image Select settings. New: Add feed summary setting to system info. Fix deprecated constructor in Browser class. Use exact dimensions on thumbnails rather than expected ones. Add target="popupwindow to Feedburner form shortcode. Fixed PHP warning on Layouts > Sidebars page under certain conditions. Fixed PHP warning when no sidebars are enabled. Fixed issue with top spacing appearing if Menu #1 is "Fixed to Top" but not enabled. Admin bar nodes are now only shown to admins. Fix problem with site title and tagline fonts not being loaded. Fixed an error with some multicheck options not appearing if they were unchecked. Fixed an issue with some checkboxes still acting as if they're checked, even when they're not. Fixed UBB ratings in meta (again! - sorry people!). 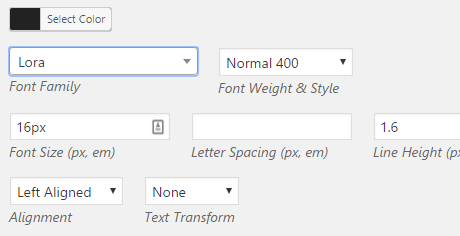 Fixed problem where you couldn't properly close font family select dropdown. Changed post meta selector from article.post .meta to simply .meta. Added support for "Recipes by Simmer" categories in post meta. Fixed problem with non-standard (something other than normal or bold) font weights not showing as saved in the settings panel. Settings panel has been migrated to a new system. Import and export tools have been moved to Appearance -> Theme Tools. System info file is now available to download in Appearance -> Theme Tools -> System Info. 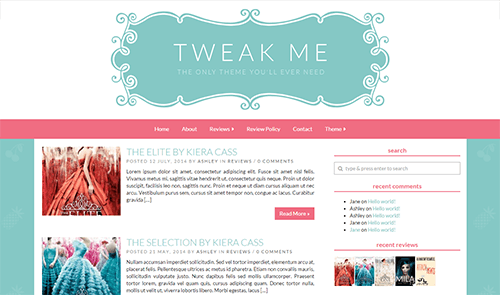 Global variable $creative_whim has been switched to tweakme2_get_option() function (old variable is rerouted). New Setting: "Paragraph Margin" (Styling -> Global). New Font Option: "Inherit". When used, this will fall back to a parent setting (usually the "Body Font"). 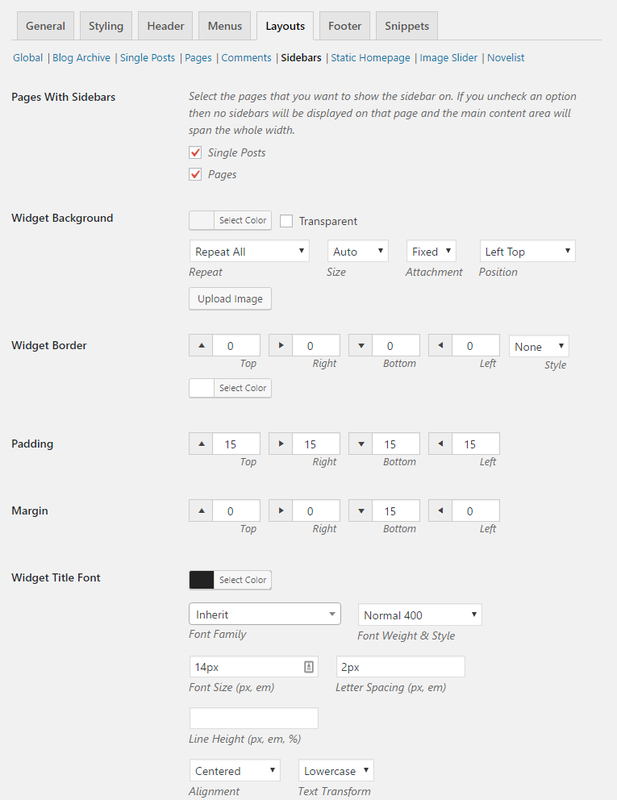 This allows you to more easily change all the fonts on the site without having to also change each individual typography option. Removed post class names from "Recent Post" widget entries. New Feature: "Announcement Bar" (Header -> Announcement). New Feature: "Top Bar" (Header -> Top Bar). New Settings: Social media profiles (General -> Social Media). 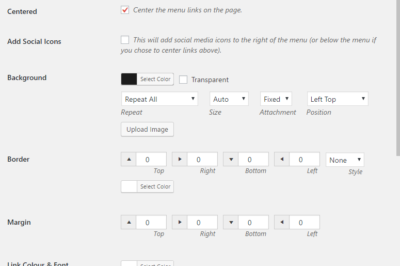 New Setting: Add social icons to navigation menus (Menus -> Menu #1, and Menus -> Menu #2). 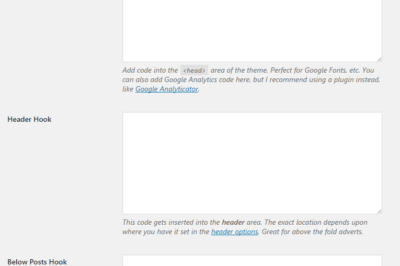 New Setting: "Content Padding" (Styling -> Global). New Settings: Heading 6 styles (Stiling -> Heading Fonts, at the bottom). 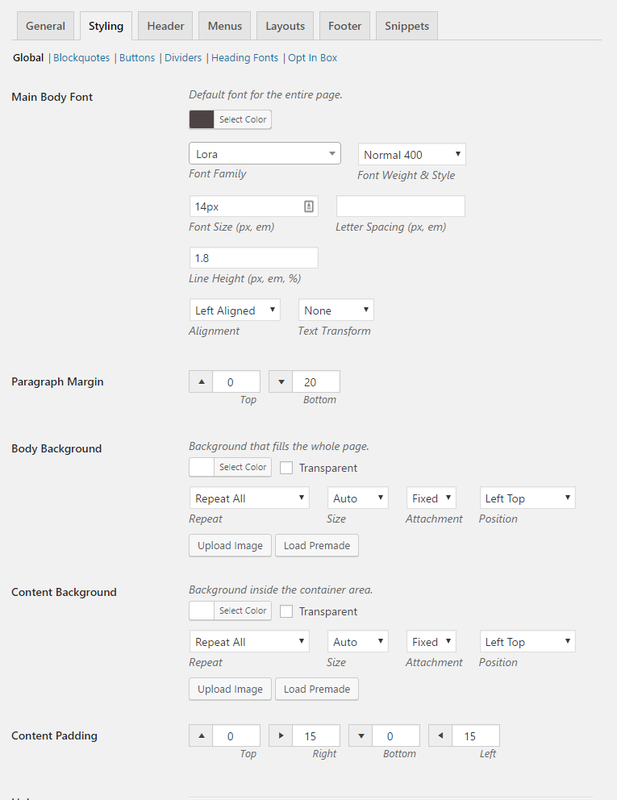 New Setting: Split or group the footer text (grouping allows you to center the text together on the page). Also removed pull-left and pull-right CSS classes from the footer text. New Hook: Below attribution. Insert text/HTML below the copyright text. Visual editor should now have more styles from the theme settings. Fixed a problem where button hover colour wasn't taking effect if you had a background image set for the regular state but not the hover state. Added new submenu links to admin bar node (under "Theme Settings"). Also changed the associated icon. Modified updater script to support PHP versions less than 5.5, but added a notice to warn people if they're using an old version of PHP. Moved license key to its own page in Appearance > Theme License. Your key should migrate over automatically. Added a max width of 100% to the "container" class. Removed "Tags" from the single post configuration. Added a new [ubbrating] placeholder in the "Meta Info" configurations to display the UBB star rating. Fixed undefined index error in single-book.php when checking sidebars. Fixed undefined index notice on Edit Book page (Novelist). Fixed "non-object" errors on sidebar templates. 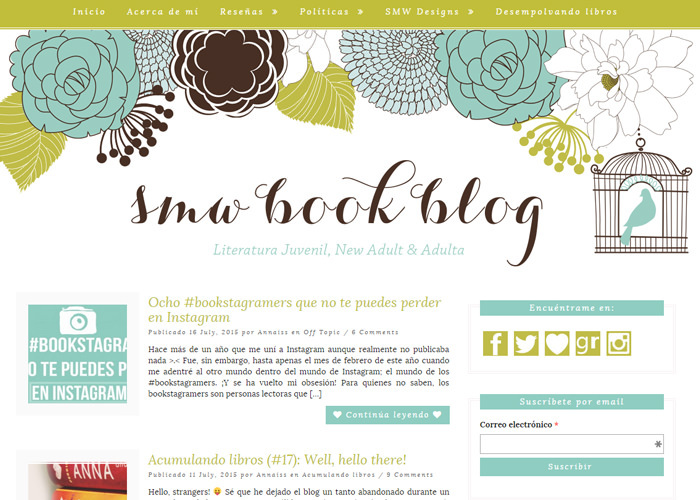 Added a "Blank Page" template with no header or footer. Force TLSv1.2 when connecting to nosegraze.com via cURL. This may fix some license activation/theme update issues. Updated Redux framework to fix a problem with the Customizer settings not working. Added styles for WordPress galleries (if they were broken they should now be fixed). Split up style.scss file into partials ( /assets/sass/ ). This doesn't actually affect the theme in any way - it's just organizational changes. Updated reference to old docs URL in settings panel help tab. Tweaked some code to prevent undefined index notices before settings are saved. Updated the Redux framework to the latest version. Reworked all functions to have tweakme2_ prefixes and proper comment blocks. Removed old pagination function in favour of `paginate_links()``. Removed "if lt IE 7" conditionals in header.php and footer.php. Moved navigation walker into its own file. Removed favicon setting in favour of the "Site Icon" built into core. Theme is now fully translation ready. Split functions into two main files: /inc/template-tags.php (for functions used inside templates) and /inc/extras.php (mostly independent actions and filters). Moved theme options CSS to wp_add_inline_css() instead of just inserting it into the area. Refactored blog post feed to use flexbox. Old column template parts have been removed as a result. Global announcement has been moved into a template part ( /template-parts/global-announcement.php ). 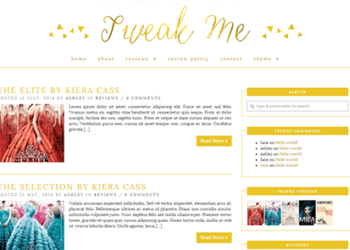 Removed the "show/hide comments on pages" setting since it's redundant with WordPress core. 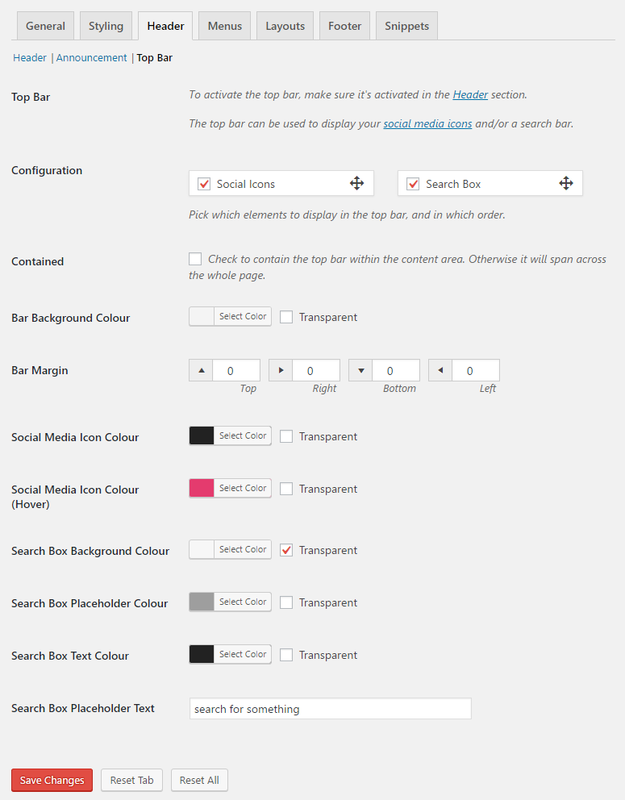 You can now configure different sidebar layouts on WooCommerce pages. Recoded custom widgets to properly sanitize inputs. Added Jetpack Photon integration into the thumbnail function. Thumbnails will now be resized with Photon if it's enabled. If your license key fails to validate, you now get a more useful error message explaining why. Removed custom profile fields (post signature). 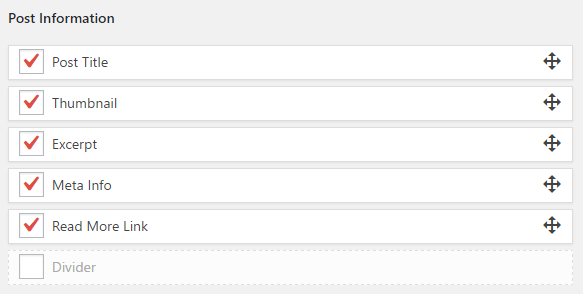 Removed colour coded post CSS in the admin panel. Re-coded where the mobile menu hamburger icons get their colour from. This should result in fewer issues with the icons "disappearing" (having the same colour as the background). Fixed "too few arguments" error on 404 page. Added a new "Landing Page" template that doesn't include the header or navigation menus. Added support for a fourth level of navigation. Added an option in the profile settings to adjust the signature alignment. 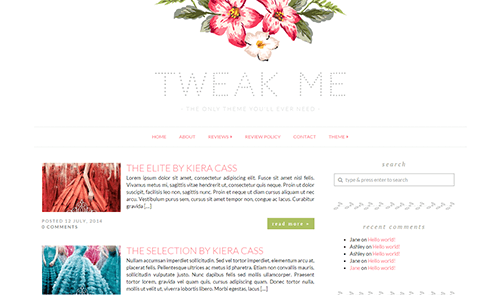 Updated some old links to Creative Whim to Nose Graze. 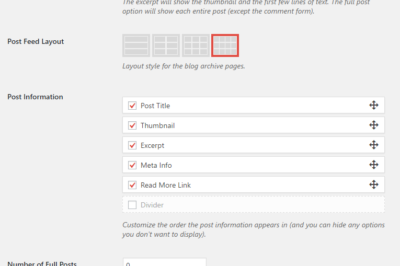 Updated tab order of comment fields to be compatible with WordPress 4.4. Adjusted the way featured image thumbnails are handled on the blog archives. You can now enter 0 for width and 0 for height for a "no resizing, no cropping" result. You can now enter your Nose Graze affiliate number in Appearance > Theme Options > Footer. This changes the Tweak Me v2 credit link to be your affiliate URL. 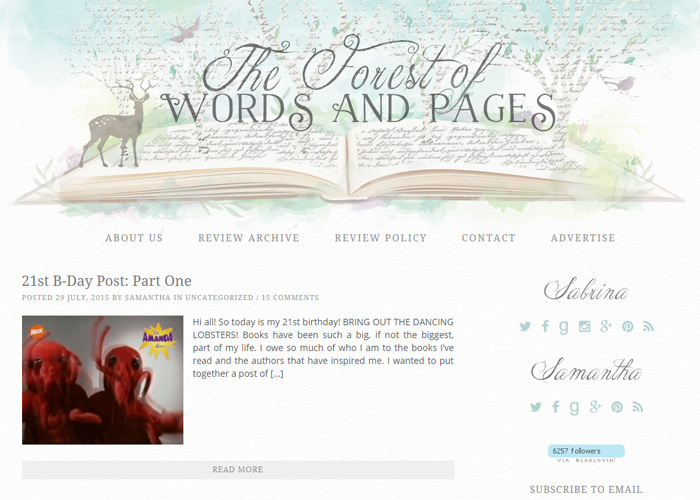 Added "page links" to the single post template to support post pagination. Updated widgets to use newer PHP constructors. 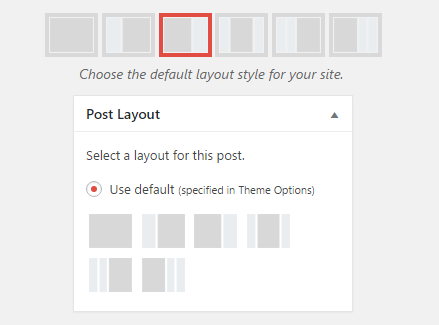 When using a multi-column post layout and you have chosen to display one or more full posts, the full posts will now span the full width of the page instead of being restricted to the chosen column width. The date (in post meta) is now displayed according to the format chosen in Settings > General Settings. Fixed a fatal error on the taxonomy archives for UBB. Updated the function for getting the average rating. Added support for an upcoming Expanding Archives widget. 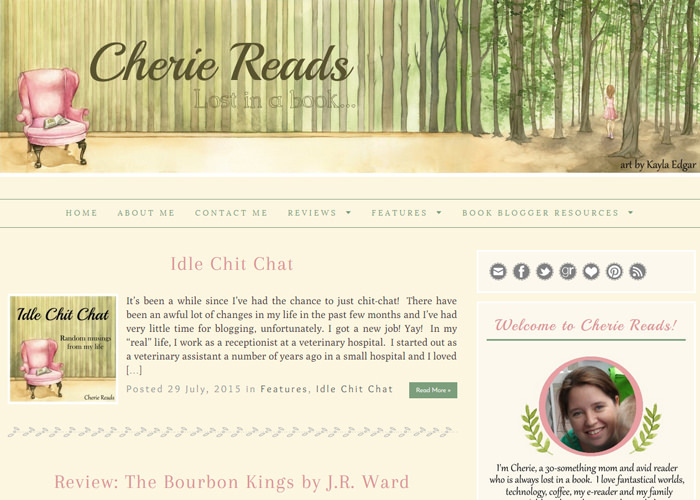 Fixed the four column blog style layout. It wasn't working and was showing posts in only one column. Added more options to the CW Recent Post widget. 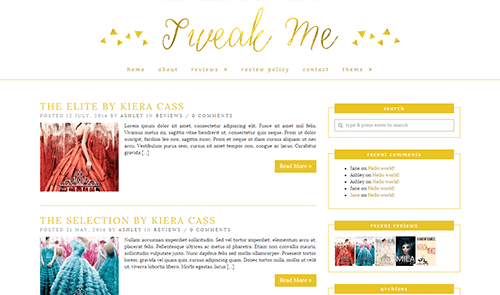 Updated the theme URL from creativewhim.com to shop.nosegraze.com. Added a space before the class name on the navigation links. Added styling for screen reader text. Changed the way the main stylesheet gets added. Removed some of the head cleanup actions. Removed the overflow-hidden class from books. 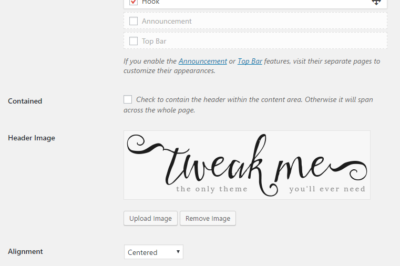 Added a filter to the featured image to make this editable in plugins and child themes. Fixed a compatibility issue with Novelist where the incorrect file path was used in one of the templates. 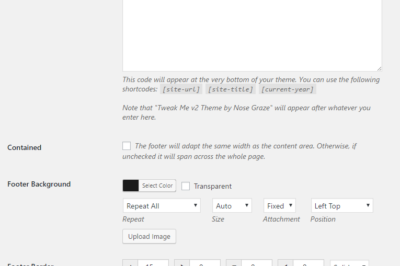 Removed the &lt;title&gt; tags from header.php and added official theme support for 'title-tag'. Tweaked the thumbnail function code. Added a filter to the header image. Added a cw_theme_inside_post action, which appears just after the post's tag. The post navigation now only shows on single post pages. Made some changes to the book template files to be compatible with the Novelist plugin. Fixed a problem with sidebars not working properly in some very specific scenarios. Replaced a few instances of get_stylesheet_directory_uri with get_template_directory_uri. Added a few new filters. 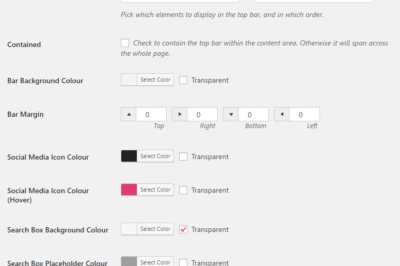 Changed the navigation submenu background fields into just a colour picker field. Changed the way I decide if a featured image can be cropped. Post signatures: you can now remove your post signature by deleting the signature URL in the textbox (Users > Your Profile). 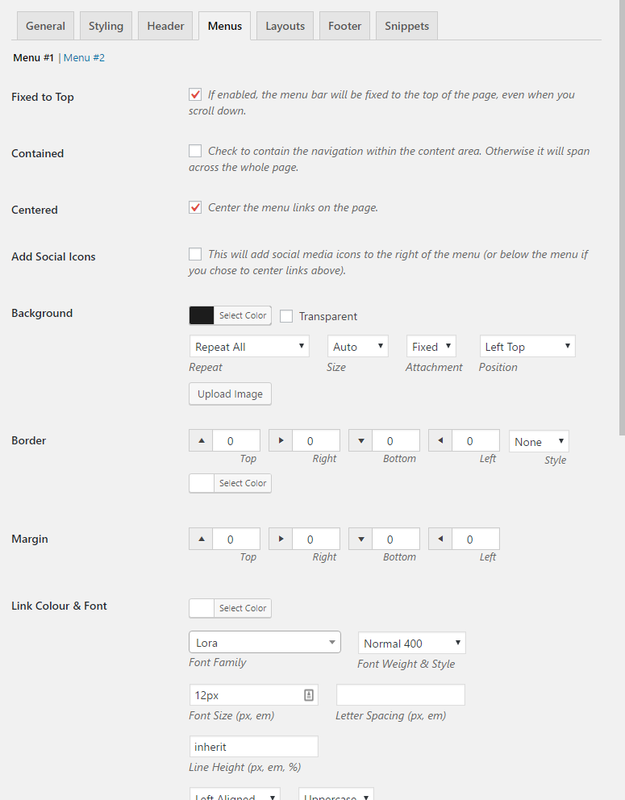 The post border/padding settings now apply to individual post pages. Added a useful 404 page template. Sticky menus now work better with the admin bar. Automatically using the first image as the thumbnail is now optional. Turn it off in the "Blog Archive" tab. 3 levels of navigation are now supported. Fixed a flexslider compatibility problem. The "number of full posts" option now only applies to the first page of results. The full posts now have a custom class name ("full-post") to differentiate between excerpts. Fixed a problem where the draggable "Order" section for Single Posts only showed up if you had excerpts selected for the Blog Archive. 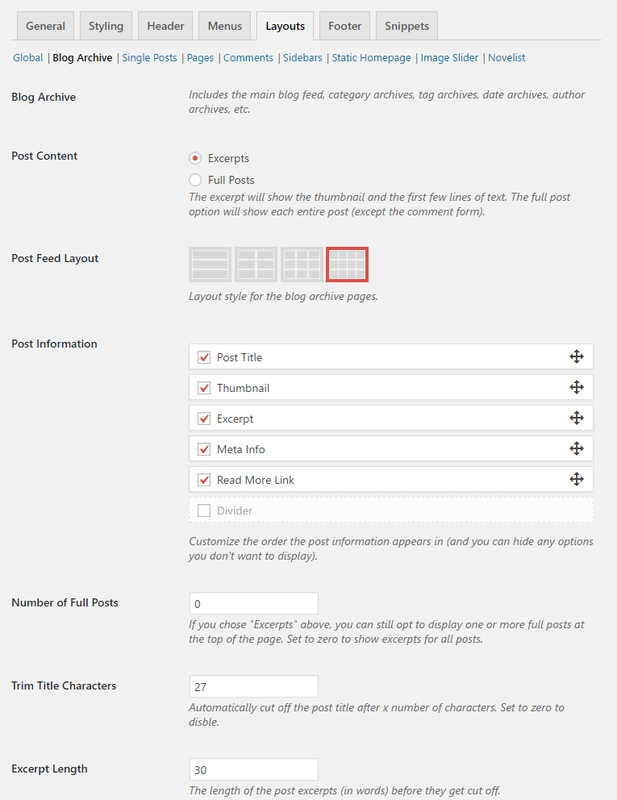 Now you can customize the tag meta on single post pages. It's been replaced with Meta Info Configuration #2, where you can use the [tags] shortcode. Changed the "(more...)" text to "Read More" (when using the &lt;!-- more --&gt; code). Thumbnail update: if no featured image is set and no UBB cover image is set, then the theme will automatically use the first image in the post. Fixed a styling issue with Font Awesome lists and the UBB Related Content tabs. 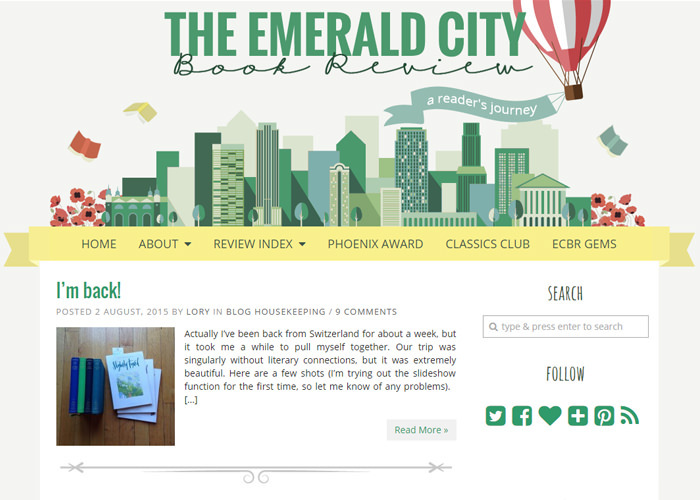 Fixed a problem where the post titles weren't linked on the blog archive if you were showing full posts instead of excerpts. Wrapped some text in comments.php in translation functions. Fixed a problem where blockquote rounded corners were not working. Fixed a problem with including the aq_resizer script. It now gets included if the function does not exist. 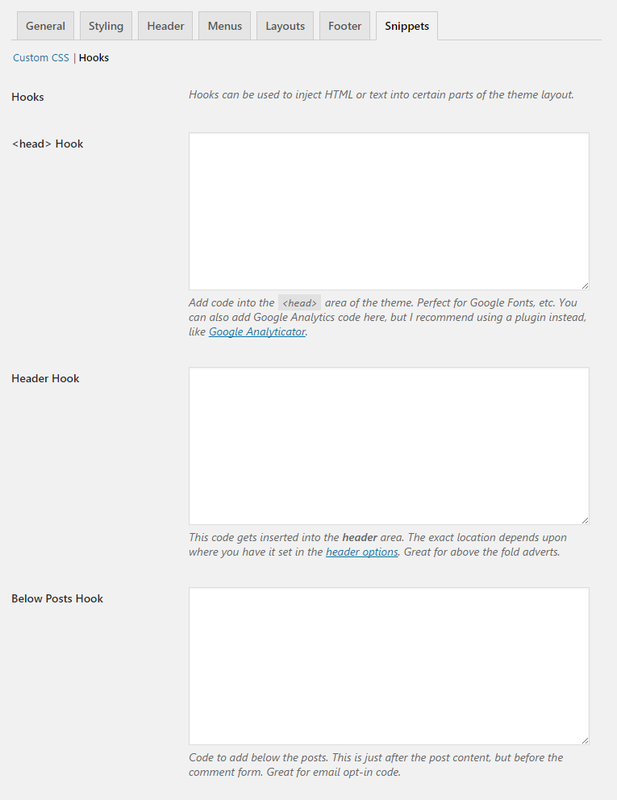 New hooks: above right sidebar and above left sidebar. Added some extra actions and filters for future skins.